Throughout the day while I've been working at home, I've been hearing some noodling on the accordion. I'm sure it's not a recording, because the music I'm hearing isn't a song or a piece, just snippets of melodies. I've gone to look for where it's coming from but I haven't been able to track it down. 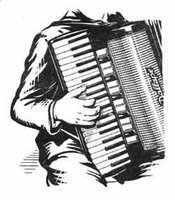 I thought perhaps this accordionist was practicing in the basement, but it doesn't seem to be the case. At least I don't find the accordion annoying as so many do. It's a nice sound addition to the street. We have a lot of musicians living on this street, besides us. The guys downstairs, the electric guitarist up the street, apparently a cellist a few doors down, and now the accordion. I hope this person stays for a while and continues on with the noodling.